UNEATLANTICO professors with Marina Ruiz and Endika Angulo, commercial delegate and responsible of the Educational Institutions of the Oxford University Press, respectively. The European University of the Atlantic is already an official test center of the Oxford Test of English (OTE), an external assessment test that enables to achieve an official English certificate. Since September, the academic institution will initiate these tests that, at the moment, can certify A2, B1 and B2 levels, but soon they will also certify C1 and C2. The Oxford Test of English will be officially recognized by the Spanish Government, the Spanish Service for the Internationalization of Education (SEPIE), the autonomic governments, and the Conference of Rectors of Spanish Universities (CRUE), among many other entities and bodies. These tests, aimed at UNEATLANTICO students and staff, but also at any person from outside the academic institution will be carried out on line from the campus computers in Santander and will be corrected by official examiners from the Oxford University. As explained by the language coordinator of the European University of the Atlantic and contact person with the Oxford University, Heidi Rohwer,one of the advantages of these tests is that, since they are on line, questions are adapted to the examined person, so there is always a result certifying the level. “There is no passed or failed”, says Rohwer. For her, the implementation of this kind of tests is “great news” that, in addition, “will enable to respond to an extended demand among students”. Each test covers the main four skills: oral and written expression and listening and reading comprehension, and the results are published on line after 15 days. The European University of the Atlantic will inform in September about the calls calendar and the test fees.. 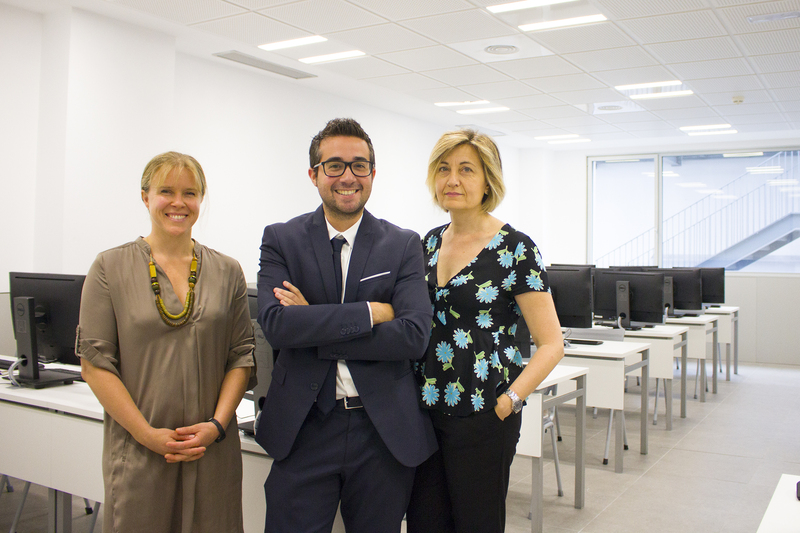 This Tuesday, the commercial delegate and the responsible of the Educational institutions of the Oxford University Press, Marina Ruiz y Endika Angulo, respectively, assisted the European University of the Atlantic to certify the last of the requirements that UNEATLANTICO had to meet in order to become an official test center of the Oxford Test of English (OTE). It was a “pilot” exam, a “non-commercial” test that was performed by a group of volunteer professors of the European University of the Atlantic, which served to check in situ that everything is ready to work with full warranty. Heidi Rohwer, Endika Angulo and Marina Ruiz in the UNEATLANTICO campus in Santander.